The silicon part of Silicon Valley needs to watch out. Chinese companies see an opportunity to take the lead in building processors that use artificial intelligence to make phones, cars and home appliances interact with us. Think of home air conditioners that recognize family members and adjust to their temperature preferences. China has the capital, the talent, a huge consumer market and rafts of data that fuel AI programs. As the world’s largest market for semiconductors, China has tried mightily—without much success—to challenge the dominance of Intel and Qualcomm in making central processing units, the brains of computers and smartphones. Now, some ambitious Chinese companies see an opportunity to take the lead in building processors that use artificial intelligence to make phones, cars and home appliances interact with us more seamlessly. Think of home air conditioners that can recognize family members and adjust to their temperature preferences. If you think about technological evolution in terms of soccer, Team China totally missed the game for personal computers, according to Yu Kai, founder of Horizon Robotics, a startup that designs chips that use AI. For the mobile internet, he says, China didn’t enter the game until the second half, but managed to play catch-up by building competitive applications. Past Chinese efforts to dominate the chip industry foundered because of poor technology and political interference. And the new crop of Chinese AI chip companies could still fail. They face formidable competition, from old hands such as Intel and Qualcomm and deep-pocketed new entrants such as Apple and Alphabet’s Google. This time around, Chinese chip makers and some analysts say, the stars are aligning. China has the capital, the talent, a huge consumer market and—crucially—rafts of data that fuel AI programs. Another significant plus: The government has set its sights on making China an AI powerhouse. Given how new these AI technologies are, everyone around the world is starting out from the same point. Any device with a chipset, from a smartphone to a car, is expected to perform an ever-growing list of tasks. To do that more efficiently, the industry is creating special-purpose chips that crunch vast troves of data to recognize patterns and identify objects with an AI process called deep learning. These chips perform functions inside the device without having to exchange data with servers in the cloud. First, buckets of money are available for the industry. Star AI startups are being showered with funding. Less than 18 months after scientists with the Chinese Academy of Sciences set up Cambricon Technologies to design AI chips for smartphones and cameras, it received $100 million from investors—including a government fund and the e-commerce company Alibaba Group Holding—in August, giving it a valuation of $1 billion. Mr. Yu’s Horizon Robotics has raised $200 million since mid-2015. The company—whose slogan is “the Intel of the AI era”—counts Intel and Russian billionaire Yuri Milner as investors. Second, with more than 750 million people online, China provides plenty of consumers and data for companies to use. Kneron, a San Diego startup founded in 2015 by former semiconductor engineers from Qualcomm and Samsung Electronics, quickly found that its biggest market is in China. The company now works with a Chinese appliance maker designing chipsets that train TVs to activate parental-control settings when children are present. In addition, its chipsets can teach robot vacuum cleaners to identify and avoid dog poop. Albert Liu, Kneron’s chief executive, says he was thrilled when one of China’s internet giants gave his team troves of online data to boost the performance of its chip algorithms on the giant’s network. That scenario, he says, isn’t likely to occur in the U.S., given its more stringent privacy concerns. Both Cambricon and Kneron say they’re already profitable, while Horizon Robotics expects to break even by 2019. And third, AI chip competitors enjoy state support. In July, the government set a goal of making China the global leader in AI by 2030. It listed AI chips as one of eight crucial technologies. 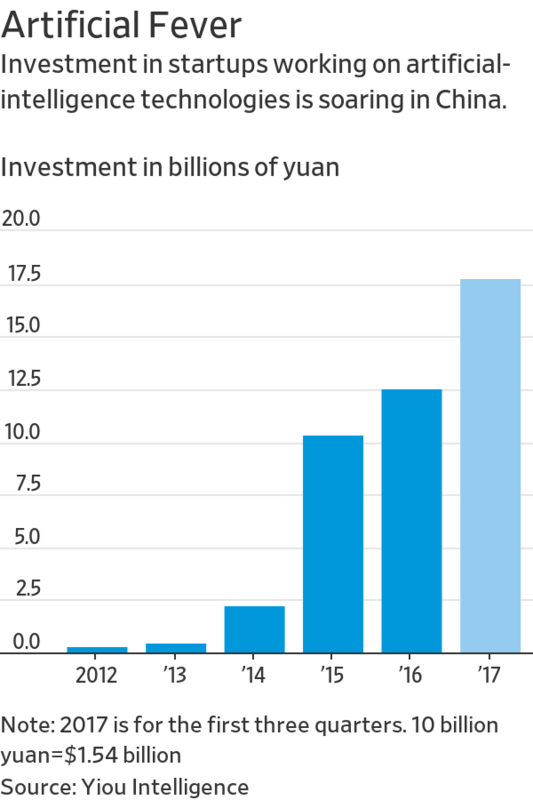 Beijing has created a $20 billion chip-financing pool—dubbed the Big Fund—and local governments have set up at least 30 more semiconductor collections, with announced financing of more than $100 billion. Fourth and finally, China has the Huawei factor: The country can tap into a growing reservoir of talented engineers. Take Huawei Technologies. While not known for its mobile-chip technologies, the telecommunications-gear and phone maker has poured resources into developing them. Its newest AI chipset, developed with Cambricon, runs on its newest flagship Mate 10 phone. Huawei gives business to startups such as Cambricon. Huawei’s engineers also leave to join or form startups. Horizon Robotics’ head of chip design is a Huawei alumnus.